About 2 years ago, a fan named Ted Moustakis, bought 3 items from the 2006 Christie's Star Trek auction sued CBS, Paramount and Christie's for $ 7 million claiming that three items he bought at the auction were fake. Of course, he needed the $ 7 million for "emotional distress". Anyone who knows me, knows I felt this guy needed a dose of reality, not a lawyer. I didn't even covert this in my blog because he pissed me off so much. This guy was everything wrong with our legal system. Someone who didn't read the rules, didn't do his research, blames the company who legitimately sold him the items, claims "emotional distress" and then sues for a ridiculous amount of money because some greedy lawyer sees a pay day. I certainly hope that his lawyer didn't take this on contingency so the plaintiff had to shell out tens of thousands of dollars for a losing cause. I even contacted CBS and offered my help if they needed it for free, (And this was before Propworx) because I wanted to make sure people like this didn't suceed. If you don't do your homework, don't read the rules or the catalog, or overbid, that is your problem, not the auction house's. Luckily, this guy lost his suit and you can read all about it here at Law.com. The case was all over the news, but really a non-news story in my book because the guy had ZERO case. It was basically buyers remorse and a lack of research on his part that caused the problem, not anything that Christie's did. 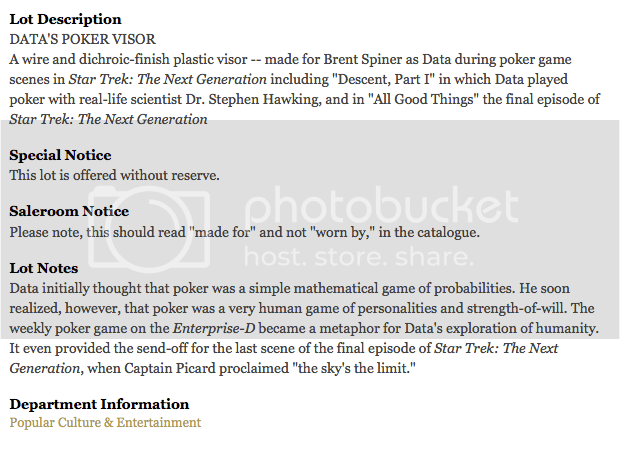 The basis of his case is that Brent Spiner told Moustakis at the 2007 Las Vegas Star Trek Convention that the Visor he bought at Christie's was not the one he wore on-screen. But this was not news. Christie's had clearly spelled this out in the catalog and in the Auction Notes, where note # 633 read: "Please note that this should read 'made for' and not worn by." You can read the entire description here on Christie's site too. Note the Salesroom Notice! Obviously Ted Moustakis didn't bother to read or understand the terminology. Moustakis also claimed that Christie's "had knowledge of hundreds, if not thousands of character duplicate uniforms that Paramount was warehousing." Moustakis claimed the art house's promotional statements, along with the description of the uniform in the catalogue, led him to reasonably believe that the item was one of a kind. Well, I am not sure what he considers "reasonable" because neither I, nor anyone I knew, made that assumption. The Court stated that "Contrary to plaintiff's contention that defendant Christie's had represented the Commander Data uniform to be one of a kind, no such representation was ever made in the auction catalog,"
In addition the court stated that the sales contract expressly stated that "all property is sold 'as is' without any representation or warranty of any kind by Christie's or the seller,". What that means is if you want to buy movie props & costumes you need to do your homework. At a studio sale, the authenticity of an item is not in question, but the status of the item, i.e. screen used, production made, etc., needs to be carefully reviewed. 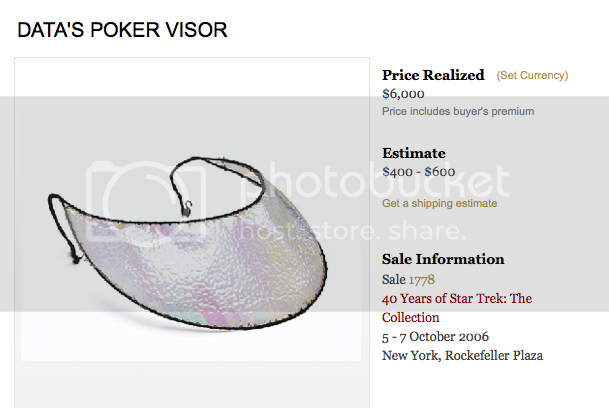 Star Trek Prop, Costume & Auction Blog makes "Star Trek Top 50 Blogs" list! Ok, it isn't like Trekmovie.com ranked Star Trek sites. But a serious Star Trek fan who maintains the Radiology Technician Schools website decided to make a list of the top 50 sites for Star Trek fans on the Internet. 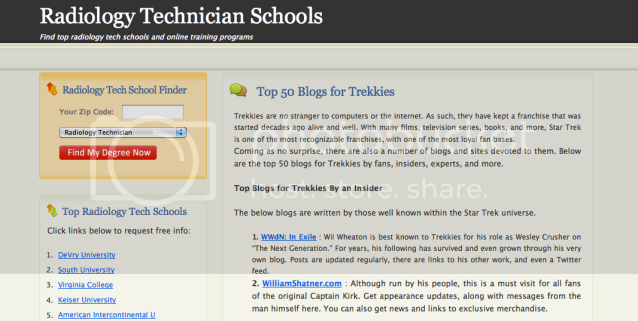 The Top 50 Blogs for Trekkies is a good list, with many sites you already know about. Not ranked 1 to 50, but rather by category, the list serves as a resource as well, that you all should bookmark in your search for more information on your favorite TV show. So, check it out and enjoy! I for one, am going to have a well deserved few days off! The first four It's a Wrap Star Trek Movie auctions ended Monday with a whimper. I was actually shocked how low the prices were for the items. Now, I didn't think any of it was particularly interesting, but none of the items went over $ 400. I could have seen most of these going around $ 500, but obviously collectors weren't impressed. Of course, IAW did no marketing in conjunction with these auctions. At least you would have thought they would have emailed everyone who has ever won an auction with them. This had a lot to do with the low prices realized I am sure. There are two more item up this week. One is a sign from Starfleet Academy with the Starfleet Chevron, which is kind of cool. It was the only piece I saw that they had that was at all interesting to me. It will be real interesting to see what these items sell for. IAW Back at it again. 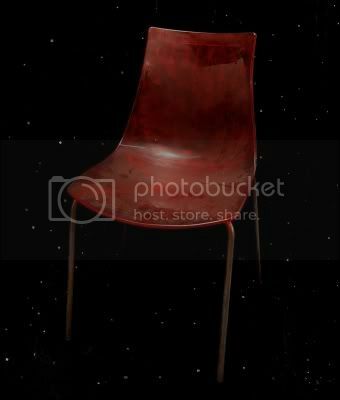 Well, this summer I got the disappointing news that Paramount had given It's a Wrap more Star Trek items to sell. Despite all our complaints and protests, Paramount was basically clueless about the problems us Star Trek prop collectors had to put up with for 2 years. In fact, it was IAW's problems that lead me to start Propworx. I simply refused to have to deal with IAW on Battlestar prop & costumes! For those of you who don't know, Paramount has the Star Trek movie rights and CBS the TV rights and all the merchandising rights. Interestingly CBS wasn't crazy about IAW and had their own problems with them during the 2 years of IAW selling everything from Star Trek that wasn't sold at Christies. 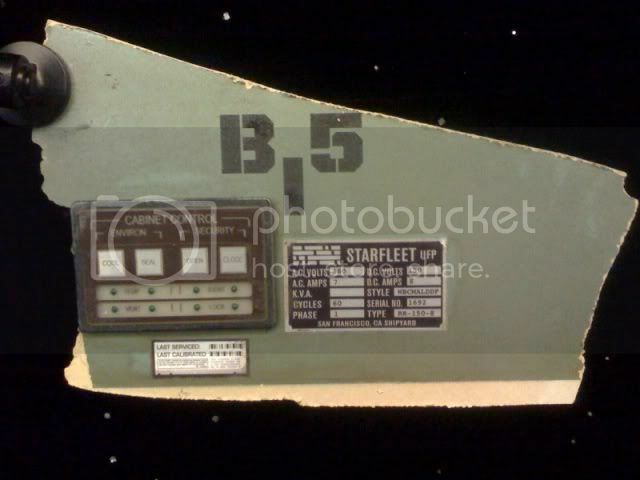 But the new Star Trek movie props are property of Paramount. What IAW got this time was basically set decoration and set pieces from various sets that weren't going to be used anymore. Paramount had to get rid of it and so called IAW to haul it away. We saw many of these pieces at the Star Trek convention this past summer and I honestly didn't see one item I would want. A lot of set decoration and background parts. IAW has a bunch, but why has it taken half a year to sell them? Certainly no longer having Colin hurts them. Colin was the Star Trek expert and the only one there that would return calls and emails promptly. (Colin moved back to Oklahoma and now has a baby!). There are 5 items this week on eBay, but none that light my fire. You can see all the items here. Christie's Catalogs on sale once again! 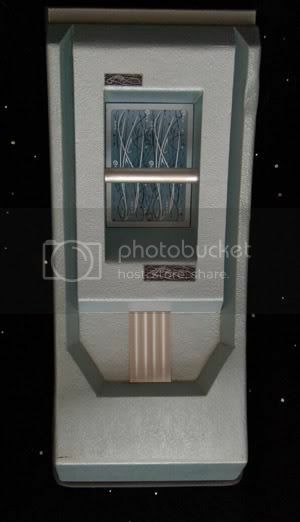 I am having a Holiday Special the Star Trek Sets $20.00 . The sale goes until I run out of the 400 sets. It starts as soon as you post it and is limited to 20 sets per person plus shipping. Overseas shipping is in two envelopes for $30.00 . Shipping is all Priority Mail with tracking . I will not ship Media Mail. Shipping is $9.00 a set in the U.S. up to 6 sets. I will also ship UPS. Anyone can email me at catalogs@catalogkid.com if they have any questions. The official ending date is December 12. 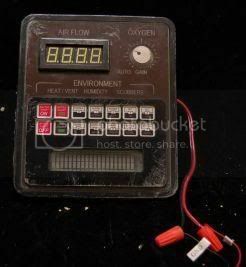 They I bring them back to $50.00 a set depending on what I have remaining from the site and Ebay. I know I am buying a few sets for future friends! 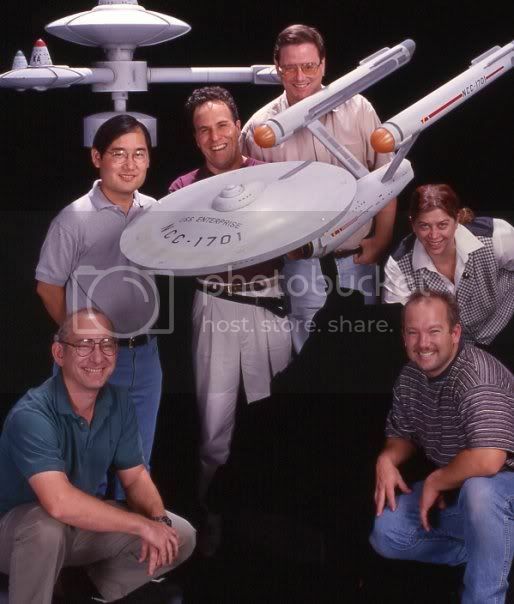 Here is a great photo Doug Drexler posted from the filming of Trials and Tribble-ations, the great DS9 episode. Now I wish I had these models! 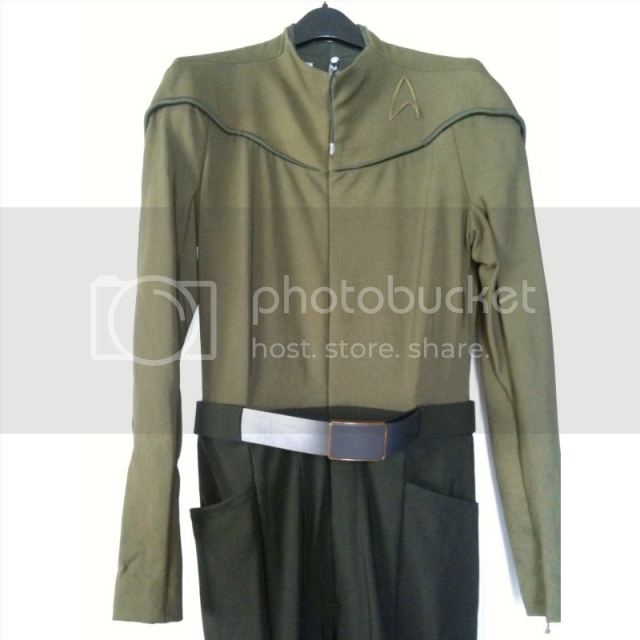 Sorry it took a while to get this up, and so many of you already know about the eBay auction for the Star Trek movie uniform from this past summer's hit movie. It is a Kelvin uniform and pretty cool. I spoke to Roger, the guy who was handling this auction, about a month ago when he sought out my advice on how to sell the costume. While a great item, waiting for this long means now the Julien's auction has devalued this item a bit since the Julien's lot has the shoes as well. None the less, it is desireable. The opening bid of $ 5,000 is rather high. The costume might go for that price, but probably not more. 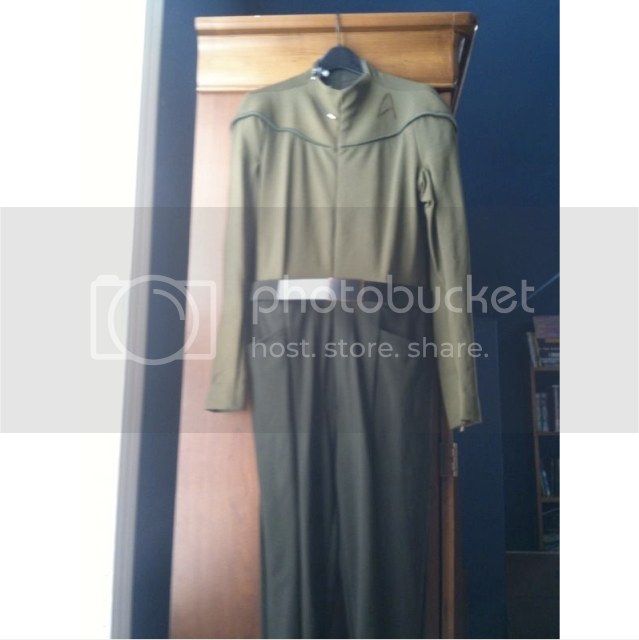 At that price you can get a Star Trek captain's costume. The reserve is $ 8,500 and that is way high. The BIN price of $ 18,000 is just unrealistic. If you are hot for a Star Trek uniform, then take a shot. 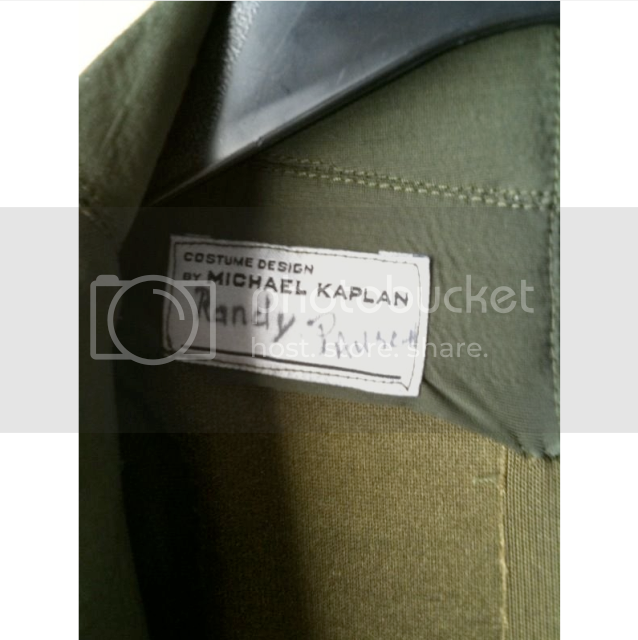 This one of a kind star trek (2009) movie uniform was worn by inspirational professor Randy Pausch, the author of the "Last Lecture." 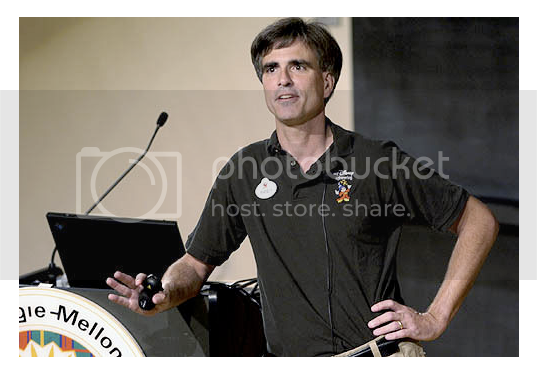 Randy Pausch, a Carnegie-Mellon Computer Science professor (and "Star Trek" fan) who gained widespread fame as the author of a "Last Lecture" in which he discussed living the life of his dreams in the face of terminal pancreatic cancer, was invited by J.J. Abrams to appear as an extra in this film. Pausch wrote in his blog about the experience, "I got a custom-made Star Trek uniform and my own station on the bridge, where I had lots of buttons and controls. I even got a LINE!!!!" Pausch died of Pancreatic Cancer on July 25, 2008. 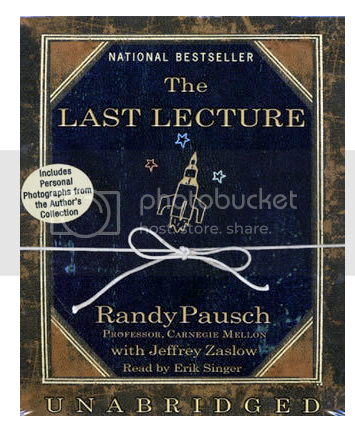 This one of kind unform was donated by Randy Pausch's wife, Jai. Winning bidder will receive a letter of authenticity from Jai Pausch.